DPS Music Academy conducts Music classes for Western Music. 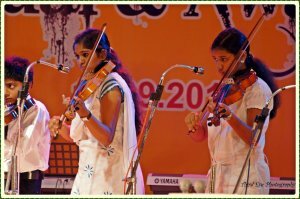 Experienced & qualified teacher of Musical education give individual attention to all the students. The classes for Piano, key Board, Violin, Guitar, Vocal, Drums & Theory of Music. To test the progress of Musical education grade exams in Western Music are conducted by the Trinity College of Music by Examiners sent from London. On an average about Sixty candidates appear for the exams. Certificates & Prizes are awarded annually during the Student’s Concert organized by DPS Music Academy .